— The feasibility of the tandem mirror (TM) concept has been experimentally proven in various devices. However, TM requires sophisticated techniques to tailor the plugging potential and has so far been limited to low-density operation. — The gasdynamic mirror (GDM) concept is intrinsically simpler than the tandem mirror; however, it requires either very long and thus massive systems, or very high-density plasma and that may increase the neutron wall load beyond what is today considered achievable within a medium-term material development program for fusion applications. A GDM design for a specific propulsion system (possibly based on ongoing efforts to design a volumetric neutron source) could now be undertaken. The goal would then be to assess the potential of GDM using assumptions, data, and technologies far more realistic than so far found in the literature surveyed. Field-reversed configurations (FRCs) can also produce either direct thrust or direct conversion to electrical power. Their main appeal is the possibility of achieving very high fl, above 50%. However, the stability of the configuration (observed so far only at large p*) must still be demonstrated at (normalized) Larmor radii p* of interest to energy production. Due to the very early stage of this line of research, it is difficult to make reliable predictions about its global confinement capabilities. These configurations might be used in conjunction with non-thermal fusion schemes, such as the recently proposed colliding beam fusion reactor. Such schemes might simultaneously solve the plasma formation/sustaining problem, and benefit from the presence of a population of fast ions to maintain the good stability properties of FRCs. Regarding magnetized target fusion, conclusions cannot be drawn at this stage, but the potential of this concept could be better assessed a few years from now, when results from the first FRX-L experiments will become available. Spheromaks have a geometry that is also conducive to direct thrust and energy conversion. Their fl are not as good as those of field-reversed configurations, but might be adequate for space propulsion, provided values >10% can be projected at typical reactor conditions. Plasma stability might require the insertion of a central conductor and ultra-low-aspect-ratio configurations akin to those of tokamaks; note that such configurations would require specific assessment. The main open question of spheromaks is whether they can maintain an effective dynamo mechanism with minimal turbulence (laminar dynamo), while keeping energy acceptably confined. Encouraging results in this direction have been obtained in reversed field pinch experiments. The dipole configuration is very attractive from the point of view of direct thrust/ direct energy generation and of the beta that may be achieved. To assess its true potential requires the testing (possibly on the LDX facility) of small-scale plasma stability and transport: theoretical predictions about the good stability of dipoles at the small scale must be experimentally confirmed. Technically, a noteworthy challenge is the construction of a superconducting coil capable of radiating all the incoming power and to produce the electrical power required for its cooling without excessive mass penalties. Although not included here, we also want to stress the possible use of spherical tokamaks for space propulsion. This configuration was not considered since it is a close—not open—magnetic field configuration, and does not lend itself easily to a propulsion application. However, it has the already proven advantage of the conventional tokamak (in terms of confinement and stability), and can achieve very high fl. Particle extraction to produce direct thrust has in principle the same difficulty of conventional tokamaks, where magnetic field lines do not escape from the reaction chamber, and nontrivial solutions should be investigated for the so-called ''divertor architecture''. This possibility has been considered in the past for space propulsion, but further studies might be beneficial in clarifying its real potential. Finally, it must be pointed out that all the classes of fusion reactors considered result in voluminous and cumbersome propulsion architectures. Some of the experiments in Section B.3 were indeed carried out with laboratory-size devices, and their power output (if any) was accordingly orders of magnitude less than required for space propulsion. Mass estimates for gigawatt-class propulsion systems are alarming when thinking of the orbit-lifting costs foreseeable in the near-term or mid-term. This is due to fundamental physics (i.e., to the impossibility of fusing at "high pressure'', e.g., 1 atm). At "high" pressure, charged particle confinement would require B fields that are simply impossible to achieve. 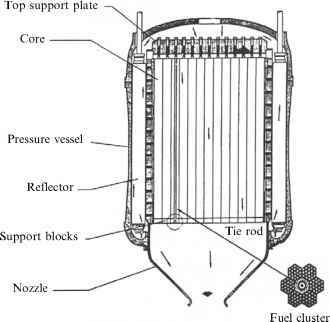 A simile in chemical propulsion would be a hypothetical constraint forcing the chamber pressure in rocket engines not to exceed tens of pascals. Thus, in assessing the potential of fusion for propulsion, priority should be given to compact systems, perhaps even at the expense of efficiency and Q. In addition, Section B. 1 made the case for fusion based on fuel availability and especially on its potential to produce large power (this is also the motivation for the ITER international fusion project). However, per unit mass converted into energy, this power is only a factor of 3 to 4 of that obtainable from fission (see Chapter 7), the only difference being the fuel itself. Whatever the class of fusion devices, the tradeoff between Isp and thrust is still an extant issue. In fact, because fusion produces low-molecular-weight products (He), one may be tempted to use only the fusion products themselves as propellant. Leaving aside technology, this strategy implies very high exhaust speed (or Isp), since the energy involved is of the order MeV per nucleon, and thus very low thrust. For instance, a 1 GW fusion propulsion system with an Isp about 105 s (see Figure 8.4) means ideally a 1 kN thrust (in fact, much less if the He jet cannot be perfectly collimated and accounting for losses). For this reason fast space travel may be achieved only by raising thrust (i.e., by adding inert propellant, with the inevitable reduction in Isp). This is also the conclusion in [Petkow et al., 2008], bringing with it a number of questions connected with mixing a low-momentum flux jet of very high energy products with a much denser and much slower jet of inert propellant. Incidentally, this is the key issue in the airbreathing SCRJ engines analyzed in Chapter 5, but in fusion propulsion this issue is exacerbated by the extreme range of parameters involved (velocity, temperature, and pressure).